Jaguar’s XJ220 was the ultimate company project car that ended up way off track. The car was the brainchild of Jaguar’s then chief engineer Jim Randle, who, with a group of like-minded associates, began the planning process back in the mid-1980s. 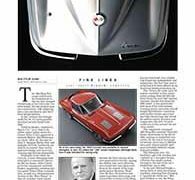 Working after hours and on weekends (they became known as The Saturday Club) Randle’s team took direct aim at such established marques as Ferrari and Porsche. 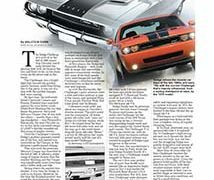 The Dodge Challenger’s arrival in the fall of 1969 meant that Chrysler had finally leveled the playing field with its General Motors and Ford rivals, in the showroom, on the street and on the track. The Challenger was a bright light that burned out quickly, mostly because, aside from being late to the party, it was out of a step with the market changes that were coming. The total number of Rolls-Royce vehicles built over more than 100 years barely equals a month’s worth of production at General Motors today. 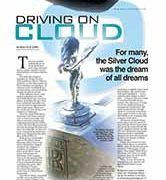 But what the company, founded by Charles Stewart Rolls and Henry Royce, lacks in quantity, it more than makes up for in opulence and pedigree. As a direct result, the Rolls-Royce marque enjoys a loyal following among the elite of society. Today, cars are designed by teams of people, but that was not always the case. Often, it was the vision of one person. 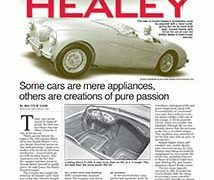 There, parked behind the ropes at the 1952 London Motor show was Donald Healey’s very own Healey Hundred sports car. 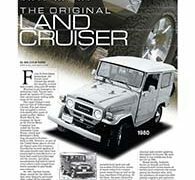 The sleek prototype (made even sleeker with its rakish fold-down windscreen) stunned show-goers with its sheer beauty. Many builders of so-called responsible four-door family cars have also built their wild childs. The two-seat AMX from the American Motors Corporation was one. More recently there’s the Subaru BRZ, a two-door corner carver that’s diametrically opposed to other Subies such as the safe and sane Forester family car and the Outback wagon. 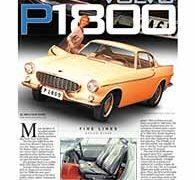 But perhaps there’s no wilder wild child than the Volvo P1800. 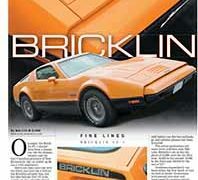 On paper, the Bricklin SV-1 should have been a dream car, but for dealers, owners and the tiny Canadian province of New Brunswick, the car ended up being a total nightmare. Much has been said and written about just how big a failure the Bricklin actually was, but the idea behind this GT-style sports car was actually ahead-of-its-time brilliant (hence the dream part). It was in the execution that things went south (the nightmare part). What kind of 12-year-old Honda sells for more than $100,000? 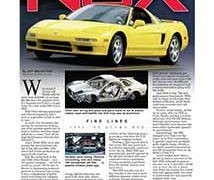 At perhaps $30,000 above the original retail, it’s the price you’ll have a to pay today for a low-miles 2005 Acura NSX. Why? Pure driving enjoyment and visceral sensation that’s next to impossible to find in newer cars. As such, this two-seater has earned the distinction of being one of the greatest sports cars in history and has also been major influence on some, if not all the high-performance vehicles that followed it. 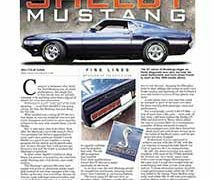 Contrary to dreamers who think the Ford Mustang was all about performance, the simple fact is that the car was not initially intended to be anything more than a hip set of wheels for a hip new generation. Performance wasn’t really part of the total equation . . . until Ford decided it was going racing. By then the Mustang was just along for the ride. The 1963 Sting Ray coupe will forever be remembered as the car that changed the fortunes of the Chevrolet Corvette brand, but not without massive controversy, GM infighting and a very prominent and short-lived design feature. In fact, without the changes made for ’63, it’s quite possible that the Corvette would have died.